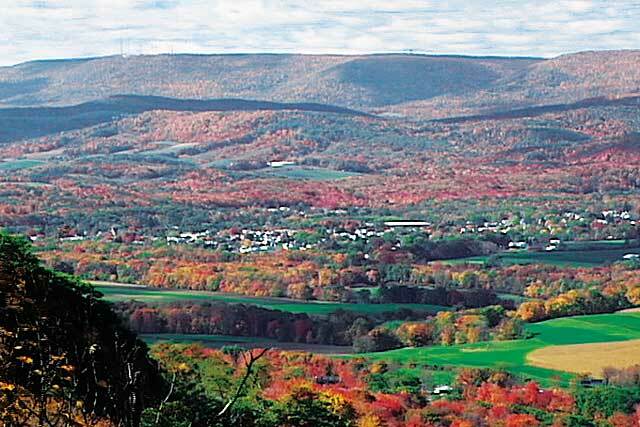 Viewed from the top of Brush Mountain at the Skelp cut looking westward, Bellwood lies in the peaceful Logan Valley, also referred to as Tuckahoe Valley in years past. The Allegheny Plateau looms in the distance, with Altoona out of view a mile to the left (southwest). The faint cluster of antennas on the left horizon is Wopsononock Lookout, accessible by car via Juniata Gap Road.